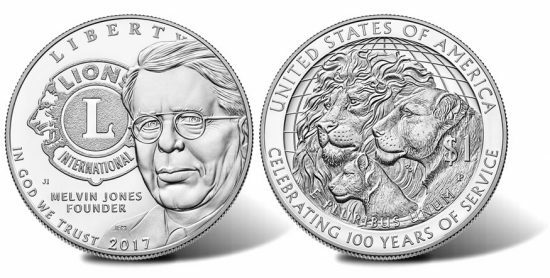 Silver coins commemorating the 100th anniversary of Lions Clubs International are now on sale at the United States Mint. Dollars in proof and uncirculated collector qualities are available at introductory prices of $47.95 and $46.95. Their prices climb by $5 after 3:00 p.m. ET on February 21. On June 7, 2017, Lions Clubs International will celebrate 100 years of community service around the world. LCI has a membership of 1.4 million people with more than 47,000 clubs providing humanitarian services. Designed by Joel Iskowitz and sculpted by Joseph Menna, the coins’ obverses show founder Melvin Jones paired with the Lions Clubs International logo. Around the two are inscriptions of "LIBERTY," "IN GOD WE TRUST," "MELVIN JONES," "FOUNDER," and "2017." Designed by Patricia Lucas-Morris and sculpted by Don Everhart, their reverses depict a male and female lion with a lion cub superimposed over a globe. Encircling the lions are inscriptions of "UNITED STATES OF AMERICA," "$1," "E PLURIBUS UNUM," and "CELEBRATING 100 YEARS OF SERVICE." Each of the silver coins are composed from 90% silver and 10% copper, weigh 26.73 grams, have a diameter of 1.500 inches, and are produced at the U.S. Mint in Philadelphia bearing its ‘P’ mint mark. About 0.773 troy ounces of silver are in each one. The U.S. Mint’s ordering pages for the two silver dollars are here. Phone orders may be called in using 1-800-USA-MINT (872-6468). Neither coin has any household order limit. The Lions Clubs International Century of Service Commemorative Coin Act, Public Law 112-181, dictates that up to 400,000 of them can be issued. investing in youth and those affected by a major disaster. 2017 will also find the United States Mint issuing Boys Town Centennial Commemorative Coins in gold, silver and clad. Their sale dates have yet to be announced.